The Great Western employed 1,943 signal, crossing and ground frame boxes throughout its system and 43 L.M.S. signal boxes, and in these pages are listings of all boxes together with their opening times and distances apart. The first signal boxes used by the GWR were erected in 1863, and as a general guide in these early days, Saxby & Farmer constructed the signal boxes between Paddington - Slough and Oxford - Birmingham and McKenzie & Holland were employed between Newport - Cardiff, West Midlands, and the Shrewsbury and Chester areas. In all other areas, the GWR used their own design of box. Almost all of these early designs were replaced by standard Great Western buildings. It is worth noting that unlike other Railway Companies, GWR signal boxes did not have decorated barge-boards at the gable ends or a walkway around the windows. 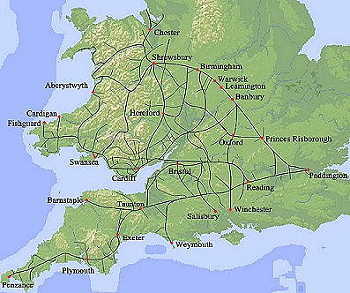 For ease of use, the Great Western Railway system is broken down into 15 sections, all available from the drop-down menu. All information shown is from the GWR Service Timetables dated October 1st 1945, and due to the recent ending of World War II, some entries are labelled 'During period of National Emergency'. As a common measurement at the time, the distances between each box is given in miles and chains. One chain equals 22 yards or 66 feet, with 80 chains in one mile.